re·li·gion: a set of beliefs concerning the cause, nature, and purpose of the universe, esp. when considered as the creation of a superhuman agency or agencies, usually involving devotional and ritual observances, and often containing a moral code governing the conductof human affairs. Posts in this category pertain to religious matters and issues. A majority of so called agnostics and atheists in Europe are cultural conservative Christians without even knowing it. So what is the difference between cultural Christians and religious Christians? If you have a personal relationship with Jesus Christ and God then you are a religious Christian. Myself and many more like me do not necessarily have a personal relationship with Jesus Christ and God. We do however believe in Christianity as a cultural, social, identity and moral platform. This makes us Christian. Jesus answered, "I am the way and the truth and the life. No one comes to the Father except through me. f you really know me, you will know my Father as well. From now on, you do know him and have seen him." Don’t you believe that I am in the Father, and that the Father is in me? The words I say to you I do not speak on my own authority. Rather, it is the Father, living in me, who is doing his work. Believe me when I say that I am in the Father and the Father is in me; or at least believe on the evidence of the works themselves. Very truly I tell you, whoever believes in me will do the works I have been doing, and they will do even greater things than these, because I am going to the Father. I rest my case: Anders Breivik, by his own admission, is not a Christian. He claims to be only a "cultural" Christian - a term that has absolutely no meaning in Christian doctrine. A recent RedState post detailed the valiant efforts of conservative students at Goshen College (Goshen, IN) to reverse the school's decision to ban the National Anthem. Apparently, the President's Council at the school deemed the lyrics of the song ("the rocket's red glare, the bombs bursting in air") to be incompatible with the school's pacifist Mennonite beliefs. Fortunately, the story has a happy ending, as the students, led by Sophomore Ryan Troyer, convinced the President's Council to reconsider its stance. The school will now allow an instrumental version of the song to be played before sporting events. However, I take issue with the views expressed by the school's president, Jim Brenneman. I believe Mr. Brenneman is in need of a history lesson. One concern that many Mennonites have had with the playing of the national anthem has been that it places love for country above love for God. But, Brenneman said, "we believe playing the anthem in no way displaces any higher allegiances, including to the expansive understanding of Jesus – the ultimate peacemaker – loving all people of the world." As I will demonstrate, the concern that the playing of the national anthem "places love for country above love for God" belies an ignorance of both the historical context and the religious connotation in the content of the anthem. Meanwhile, Britain’s naval force, buoyed by its earlier successful attack on Alexandria, Virginia, was poised to strike Fort McHenry and enter Baltimore Harbor. At 6:30 AM on September 13, 1814, Admiral Cochrane’s ships began a 25-hour bombardment of the fort. Rockets whistled through the air and burst into flame wherever they struck. Mortars fired 10- and 13-inch bombshells that exploded overhead in showers of fiery shrapnel. Major Armistead, commander of Fort McHenry and its defending force of one thousand troops, ordered his men to return fire, but their guns couldn’t reach the enemy’s ships. When British ships advanced on the afternoon of the 13th, however, American gunners badly damaged them, forcing them to pull back out of range. All through the night, Armistead’s men continued to hold the fort, refusing to surrender. That night British attempts at a diversionary attack also failed, and by dawn they had given up hope of taking the city. At 7:30 on the morning of September 14, Admiral Cochrane called an end to the bombardment, and the British fleet withdrew. The successful defense of Baltimore marked a turning point in the War of 1812. Three months later, on December 24, 1814, the Treaty of Ghent formally ended the war. 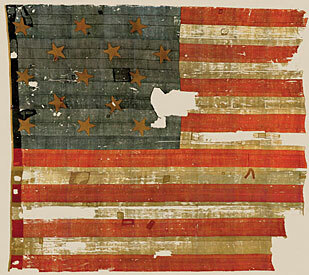 Because the British attack had coincided with a heavy rainstorm, Fort McHenry had flown its smaller storm flag throughout the battle. But at dawn, as the British began to retreat, Major Armistead ordered his men to lower the storm flag and replace it with the great garrison flag. As they raised the flag, the troops fired their guns and played “Yankee Doodle” in celebration of their victory. Waving proudly over the fort, the banner could be seen for miles around—as far away as a ship anchored eight miles down the river, where an American lawyer named Francis Scott Key had spent an anxious night watching and hoping for a sign that the city—and the nation—might be saved. Friends of Dr. Beanes asked Georgetown lawyer Francis Scott Key to join John S. Skinner, the U.S. government’s agent for dealing with British forces in the Chesapeake, and help secure the release of the civilian prisoner. They were successful; however, the British feared that Key and Skinner would divulge their plans for attacking Baltimore, and so they detained the two men aboard a truce ship for the duration of the battle. Key thus became an eyewitness to the bombardment of Fort McHenry. In fact, it is from this poem in which are rooted not only our national anthem and the symbolism of Old Glory, but also our national motto: "In God We Trust." Far from placing love of country before love of God, the song glorifies God as "the Power that hath made and preserved" our nation, and who has blessed our nation with victory and peace. If history has proven anything, it has proven that peace requires constant vigilance and struggle against those who would oppress. In the words of Thomas Jefferson, "The tree of liberty must be refreshed from time to time with the blood of patriots and tyrants. It is its natural manure." Even as peacemakers, war can be imposed upon us - and as reprehensible as we may find war to be, those who fight on our behalf do so with a just cause. In addition, the national anthem is one way that is commonly understood to express an allegiance to the nation of one's citizenship. The college has shown that in the past in other ways: flying a flag on campus, praying for all men and women serving our country, welcoming military veterans as students and employees, annually celebrating the U.S. Constitution and encouraging voting. It is counter-productive to pray for all men and women serving our country, while at the same time decrying any and all reference to the means they must emply to protect our country and our freedoms - including our freedom to worship God and to live as peacemakers. Finally, the decision was made with the belief that "playing the anthem opens up new possibilities for members of the Goshen College community to publicly offer prophetic critique – if need be – as citizens in the loyal opposition on issues of deepest moral conviction, such as war, racism and human rights abuses," according to the statement by the President's Council announcing their decision. While the intrinsic tie between the national anthem and war is understood, what, pray tell, does the national anthem have anything to do with racism and human rights abuses? What opportunity does the playing of the national anthem provide for prophetic critique in loyal opposition to racism and human rights abuses? This statement implies that the national anthem represents such matters - an implication that I find to be abhorrent. The national anthem represents the best of America: a nation founded on the principle that our rights derive from our Creator, and that all men are created equal, and have equal right to life, liberty, and the pursuit of happiness. More American blood has been shed protecting and defending those rights - not only of Americans, but of all people the world over - than that of any other nation in history. In closing, Mr. Brenneman, I applaud both your willingness to hold open dialogue on the matter of the playing of the national anthem, and your willingness to reconsider your stance. I urge you, however, to temper similar decisions in the future with the sober remembrance of the unique blessing of God that is our great nation, as well as the great sacrifices of our forefathers that have given us the freedoms we exercise - and often take for granted - today. Utilize Powerful Conservative Terms: using powerful new conservative terms to capture better the original intent; Defective translations use the word "comrade" three times as often as "volunteer"; similarly, updating words that have a change in meaning, such as "word", "peace", and "miracle". It is these guidelines that induce me to declare the project to be blasphemous. I am a conservative, and adhere to conservative ideals. However, the purpose of the Word of God is not to promote conservatism versus liberalism, but rather to glorify God and to provide God's plan for the salvation of mankind through Jesus Christ. Period. End of story. Any other agenda is non-scriptural. In the course of this discussion, I will show how I believe the CBP to pervert the true meaning of Scripture in the advancement of their agenda. In the United States and much of the world, the immensely popular and respected King James Version (KJV) is freely available and in the public domain. It could be used as the baseline for developing a conservative translation without requiring a license or any fees. Where the KJV is known to be deficient due to discovery of more authentic sources, exceptions can be made that use either more modern public domain translations as a baseline, or by using the original Greek or Hebrew. For a project that is ostensibly concerned with correcting Biblical translation errors, including linguistic errors and archaic terminology, why would they choose a four hundred year old translation as their basis? Using the KJV actually re-introduces sources of translational error that they claim has been addressed by modern linguistics. Why not use a more modern translation such as the NIV or ESV? The NIV was written only 30 years ago, and its translation team went to great effort to modernize the translation while remaining true to the original manuscripts. The committee in charge of updating the bestselling version, the NIV, is dominated by professors and higher-educated participants who can be expected to be liberal and feminist in outlook. As a result, the revision and replacement of the NIV will be influenced more by political correctness and other liberal distortions than by genuine examination of the oldest manuscripts. As a result of these political influences, it becomes desirable to develop a conservative translation that can serve, at a minimum, as a bulwark against the liberal manipulation of meaning in future versions. Of course, the CBP seemingly fails to recognize that those "professors and higher-educated participants" are bona fide Biblical scholars and linguistic experts - whose expertise is clearly and evidently lacking in the project's resulting Conservative Bible, as I will demonstrate. Having rationalized their exclusion of the NIV, why then do the CBP members not choose to write their translation from the best available source: the manuscripts themselves? Perhaps it is because they have eschewed the expertise needed to read, understand, and translate those manuscripts, in their rejection of "professors and higher-educated participants"? However, if one believes the Bible to be the Word of God written for His purposes, which I do, then the idea of recalibrating the language to suit partisan political purposes in this age is pretty offensive — just as offensive as they see the “liberal bias” in existing translations. If they question the authenticity of the current translations, then the only legitimate process would be to work from the original sources and retranslate. And not just retranslate with political biases in mind, but to retranslate using proper linguistic processes and correct terminology. I believe both the translation guidelines and the source text to be critically flawed. Therefore, I believe the project to be doomed from the start. 1 The book of the generation of Jesus Christ, the son of David, the son of Abraham. The ancestry of Jesus Christ, descendant of David, descendant of Abraham: "Descendant" is more accurate than "son." 2 Abraham begat Isaac; and Isaac begat Jacob; and Jacob begat Judas and his brethren; Abraham was the father of Isaac, who was the father of Jacob, who was the father of Judah and his brothers, The passive "was the father" emphasizes the ancestry. I am no Biblical scholar, but even I can recognize the sophistry at work here. The Bible uses incredibly rich, symbolic language with multi-layered meaning. The Conservative Bible would obliterate much of the beauty and internal cohesiveness of Scripture, in the name of advancing a conservative agenda. Take Matthew 1:1 - the Conservative Bible would replace Jesus Christ, the son of David, the son of Abraham with Jesus Christ, descendant of David, descendant of Abraham, using the reasoning that descendant is more "accurate" than son. This sophmoric reasoning completely ignores the cultural significance of Jesus Christ being called the son of David, the son of Abraham. It completely ignores the Biblical symbolism of Jesus' self-reference as the Son of God and Son of Man. Further, it gives no justification from the original text to explain why descendant is "more accurate" than son. Next, take Matthew 1:2 - the Conservative Bible would replace begat with was the father of, this time using the reasoning that "the passive 'was the father' emphasizes ancestry. Once again, this so-called reasoning completely ignores (and explicitly undermines) the Biblical significance of the masculine lineage of Jesus Christ, that connects him with both the one man, Adam, through whom sin entered the world, and Abraham, through whose seed God promised the Messiah would come. But the CBP doesn't just stop at sophmoric perversion of the beauty and depth of Scriptural language. Rather, it presses on, ironically doing precisely that which the CBP accuse the "professors and higher-educated participants" in the NIV translation team of doing: adulterating scripture in order to promote an ideological agenda. 22 And no man putteth new wine into old bottles: else the new wine doth burst the bottles, and the wine is spilled, and the bottles will be marred: but new wine must be put into new bottles. "And no man puts fresh grape juice into old bottles. The fresh juice will burst the bottles, spilling the juice and damaging the bottles. Fresh juice must be put into new bottles." The Greek word ασκοσ, translated "wine," actually meant "fruit of the vine" and was not fermented, as it commonly is today. Repeated references in the Book of Proverbs tell their readers specifically to avoid fermented grape juice. Furthermore, at least five methods of preservation were known to the ancients, methods that avoided fermentation, long before Louis Pasteur would invent his pressure-cooking method. The obvious agenda here is the removal of an obvious reference to alcoholic wine. The explanation given is neither textually accurate nor correct from an enological point of view. First, askos (Greek: ασκοσ - a leathern (or skin) bag used as a bottle) refers to a leathered animal skin (i.e. wineskin), and in this context Jesus was clearly referencing this usage: a wineskin. The wineskins were animal (usually goat) skins sewn together for the purpose of short-term storage and and fermentation of wine. Fermentation involves the consumption of yeast and sugar in order to produce ethanol - the by-product of which is carbon dioxide gas. It is this carbon dioxide off-gassing that caused the wineskins to expand. Without fermentation, the wineskins would have had no reason to burst. New wineskins were used for new wine, because the unused wineskins would still be supple enough to expand to accomodate the carbon dioxide off-gassing. If new wine were placed in old (i.e. used) wineskins, the wineskins would have already once been expanded, and would lack the necessary elasticity to accomodate further expansion. Thus, when the new wine fermented, the carbon dioxide would over-pressurize the old wineskins and cause them to burst. This extra-scriptural translation also obscures the point of Jesus' statement. Use of the more modern askos definition of earthenware jar (which, coincidentally derives its name due to its shape's similarity to the earlier animal skin vessel) makes no sense in this context. Jesus is implying that the Pharisees have already been expanded and hardened by their ritualistic view of Judaism, and were no longer acceptable vessels for his new wine; rather, only new vessels (the sinners with whom he was eating) were suitable for his new wine. Substitution of an earthenware vessel (a "bottle") here renders this understanding meaningless, since such a vessel is never capable of expansion caused by the fermentation of the new wine. These are but a sampling of the resulting translation work of the Conservative Bible. This agenda-driven translation produces factual errors and adulterates scripture. This result is, in fact, blasphemous, and Christians should have nothing to do with the Conservative Bible Project. I do not believe my words to be too harsh. Any attempt to pervert or adulterate the Holy Word of God, for any reason whatsoever, commits the same sin of pride that befell Lucifer, by placing the wisdom of man above the perfect, omniscient wisdom of God, or, as Gawain's Ghosts calls it: conceptual idolatry. Such an act truly is evil. The Anchoress nailed this one a couple weeks ago. When we honor God with our firstfruits, He promises to provide abundantly to us. The One Year Bible Blog´s comments for today. Continuing on yesterday's theme from Proverbs 3, today we read verses 7 and 8, which promise that humility, shunning evil and fear of the Lord will bring health. God promises to meet our needs, and never to abandon us without hope when we are afflicted - what comforting promises in times of need! Proverbs 3 includes three distinct promises. First, keeping God's commands in our hearts will bring us long life and prosperity. Second, keeping love and faithfulness in our hearts will bring us favor from and a good name with God. Third, trust in and acknowledge God in everything, and he will guide and direct us. God is certainly neither subtle nor vague in His expectations for us. He desires for us to desire to humble our self-centeredness and pride, and to replace them with God's Law and a desire to be obedient to God's Law. I find it interesting that love and faithfulness are referenced directly here: love and faithfulness being the the fundamentals the New Covenant, as established by Christ through the fulfillment of God's Law. Abraham demonstrates his faith and obedience in this test, that must have been his most difficult; and in return, God re-affirms His promise to Abraham. 7 "Ask and it will be given to you; seek and you will find; knock and the door will be opened to you. 8 For everyone who asks receives; he who seeks finds; and to him who knocks, the door will be opened. God promises that He will provide all "these things" - what to eat, what to drink, what to wear - if we will only place our trust in Him, and seek His kingdome and His righteousness. The ironic reality is that even when we choose the contrary, in all of our worrying and working we can never provide for ourselves as well as God provides for us, if we only let Him. 9 Then the angel of the LORD told her, "Go back to your mistress and submit to her." 10 The angel added, "I will so increase your descendants that they will be too numerous to count." Here God is promising to produce a great nation also through Hagar's son, Ishmael, just as He would produce a great nation through Abraham's and Sarah's future son, Isaac. Unfortunately, God also prophesied the enmity between the two nations - enmity that very likely is a direct result of Abraham's act of unfaithfulness (in sleeping with Hagar rather than waiting on God to fulfill His promise) and Sarah's act of pride and jealousy (in mistreating the pregnant Hagar). I find the choice of phrase used by the angel of the Lord to be quite interesting; he commanded Hagar to submit to Sarah, while Hagar was pregnant with Ishmael, from whom would come Islam - a religion predicated upon submission. 14 The LORD said to Abram after Lot had parted from him, "Lift up your eyes from where you are and look north and south, east and west. 15 All the land that you see I will give to you and your offspring forever. 16 I will make your offspring like the dust of the earth, so that if anyone could count the dust, then your offspring could be counted. 17 Go, walk through the length and breadth of the land, for I am giving it to you." 4 Then the word of the LORD came to him: "This man will not be your heir, but a son coming from your own body will be your heir." 5 He took him outside and said, "Look up at the heavens and count the stars—if indeed you can count them." Then he said to him, "So shall your offspring be."